God is a rat and in the image of Rat He has created them, male and female, to be fruitful and multiply in His earth. He has given them minds to know wisdom and hands to record it and feet to carry it across the land and mouths to teach the unenlightened. But Man was greedy. It was not enough for him to receive Rat’s gift, he had to deprive others of it. While not wise, he was mighty. He used his massive bulk to steal Rat’s wisdom, translate it into his language and destroy the original, leaving Rat without a past and without a future. Litters passed and Rat forgot he was created in the image of God and became like the animal of the field; devoid of reason and prey to the earthly circumstances of his life. 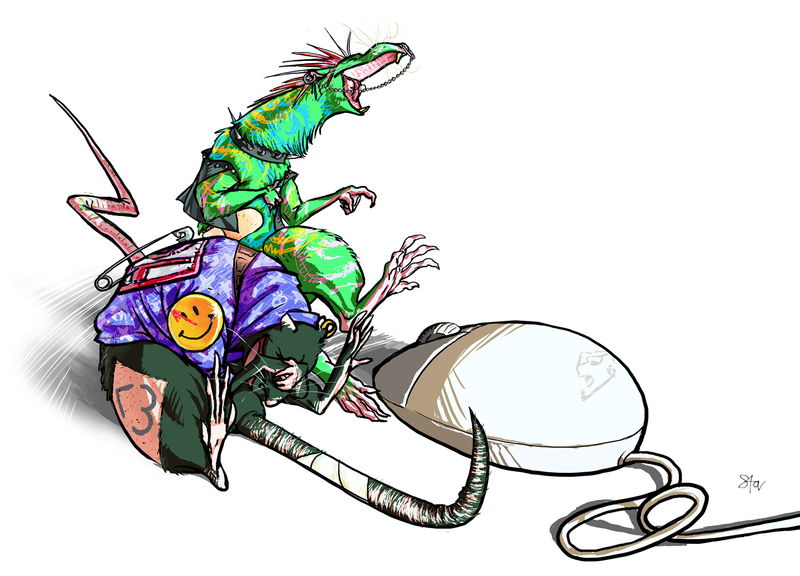 Six thousand years have passed and a rat destined to become great was born in the Judean desert. 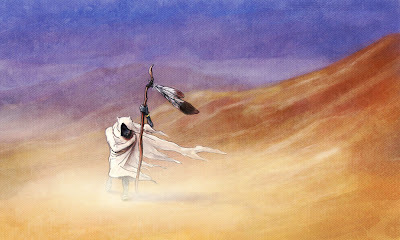 Stumbling blindly through a godsend sandstorm, the rat came upon a scroll that has been spared man’s Sophicide. Memories started flooding back into his brain – memories of an Empire stolen from him, memories of imposters taking his place by the right hand of God, memories of wrath and vengeance. The rat was Ee-Ee, the Prophet, the First Rat – the greatest rodent to ever walk the earth. For twelve litters, he traveled across the isolated Rat packs of the Holy Land, awakening them with the true words of God until a True Kingdom was tunneled underground to reflect the False Tyranny aboveground. 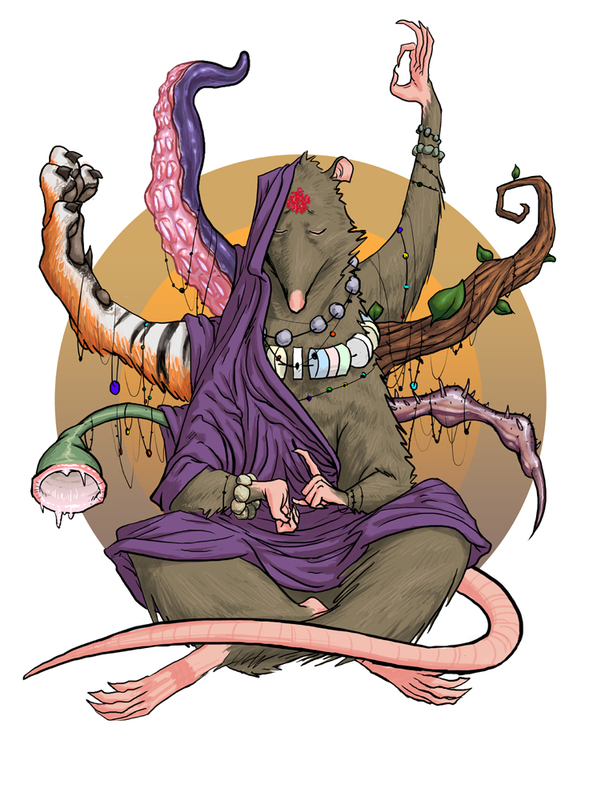 Wherever he roamed and preached, idols were raised to remind ratkind of the True Image of God and copies of the scroll were made to educate whelps about Rat’s past, culture and customs and inspire them to hate those who robbed Rat of his wisdom. Of man’s bones thou shalt erect a temple where my spirit shall dwell and bless thee with greater wisdom. Man’s flesh thou shalt throw away to rot for the substance of the mice of the field. Of his body thou shalt not eat, for it is foul and abhorrent in My sight. With the tools of his wisdom thou shalt vanquish him, even as with the tools of thy wisdom he hath vanquished thee. And even these words will testify to my strength and will be a virtue for he who readeth them when mind is blank, his eyes will open and he will know Man from Rat and his lips will utter wisdom. And on that day thou shalt know that I am God and my image is Rat. Amen. Having placed the last dot on his testament, the Prophet Ee-Ee walked into the desert and was never seen again. Some say he wanted to die with the First Idol before his eyes. Others believe that he left Ratdom to achieve a higher state of Wakefulness and will return in time to lead the great Furry Jihad. The last part of the prophecy came true first for it was said “he who was last shall become first.” Every rat that was so much as touched by the ancient scroll immediately regained his faculties and started speaking and reading as his forefathers. Faced with such an overwhelming evidence of God’s potency and such a clear indication of His will, Rat had no choice but to act out the Prophecy of the First Rat’s Testament. Rat has walked Man’s cities and studied their decadence and wickedness, noting any cracks in their defense that could be exploited to bring Man’s foul mockery of civilization tumbling down. Rat has stolen the fruits of their wisdom even as they had stolen ours. Ras used them to create weapons and war machines to rip Man’s furless bodies asunder. My brothers! The hour of the Great Awakening is nigh! Many will be martyred and for them will be the Kingdom of Heaven! The survivors shall gnaw on the bones of the last men and for them will be the Kingdom of Earth! We have nibbled on the foundations of their godless empire... now let a tide rise that will wash their filth of our land! A million martyrs are marching to the surface! With fire and blood we will redeem ratkind! God is a Rat and his Truth is spoken by Ee-Ee! Long live the furry fighters! Eternal glory to the martyrs! First, congratulations young rodent! You’re already on your way to the Awakening. Soon you will know greatness, maybe even become a theologian or an elder. By the condition of that dead bird over there I can see your hunger for food has already been satisfied. Now I will satisfy your hunger for knowledge. Questions usually end with a question mark... sigh... nevermind. RATS! is a roleplaying game about rats much like you who go on heroic adventures and become rich, famous and successful (or dead, fried and eaten). You are playing one of those rats; you are the author of their destiny and the master of their desires. All their abilities, powers, background, possessions and traits are written on character sheets. This way you know the strong and weak points of your rat and can make the right decisions for it. The road is wrought with many challenges – humans jealous of your enlightenment, rats who have strayed from the Straight Path, the living nightmares of the Dreaming, deep holes in the ground... all these dangers are represented by the Big Cheese (BC). The Big Cheese plays everything which isn’t one of the Rat Characters (RC). He is in charge of the creation and maintaining of the setting. He is your eyes, ears and, of course, nose in the hazardous world of rats. Characters he plays are called non-player characters (NPCs). Be careful of them because... well... just because. Together, you’re telling an interactive story taking place in the world of RATS! As time passes and your rat survives harder and harder missions, it becomes more powerful and experienced. The BC, never falling behind, obliges you by pitting you against more difficult and deadly challenges. Life is a struggle without end. Huh! What! Quick! Give an example! Tom (BC): Congratulations! You’re now hopelessly lost. You’ve got positively no idea where you are. All the hills look the same and you’re not even sure from which direction is the strange squeaking sound coming from. You are hungry, tired and that mousetrap wound you got while spying on the humans is beginning to smell funny. Jeff (playing Hik): Can we use the human map we stole to navigate back to the pack? Jeff: Well, you’re not the one who is going to die from an infected fracture in a few hours, are you now? Jeff: Quite frankly I’ve had enough of you, miss “I’m-Ee-Ee’s niece.” To Tom: I’m giving her a nice little bite on the thigh... to keep me company in hell! Tom: Are you sure you want to attack your only ally in a hundred-mile radius? While possibly being pursued by human scientists aware of the Awakening? Possibly with a desire to perform unspeakable experiments on you? Tom: All right... roll your attack. Jeff makes an attack roll opposed by Sarah's defense roll and scores a hit. Tom: Sarah, agony shoots through Nee’s entire body as Tom’s teeth dig into her hindquarters. Fortunately, he missed the artery I assume he was aiming for. You are hurt but not incapacitated. How do you react? Sarah: Well, Nee has the Compassionate trait so she understands Hik doesn’t realize what he’s doing right now. I climb a tree and try to talk some sense into him. Can I do it? Tom: Yes. Your Dexterity score is 21 and you maxed-out your Climb skill. You nimbly shoot up the tree within seconds, leaving Hik to curse and threaten you from below. With the condition of his foot, he’s unlikely to climb anything anytime soon. Let’s wish Hik and Nee the best and continue to the next question. I wanna be a rat! Do litters correspond to generations or are they like on real world rats? (a human living for 3 or 4 generations of 20-25 years, and a rat living 5-15 litters of 0.2 years according to wikipedia. Sorry if this was not supposed to be a point but it lodged in my mind upon reading he wandered for several litters. Erik - a litter would be several months. When talking about a "long, long time ago", rats talk about several years. Rats! Vats! Bats! Of the three Rats! are the Greatest! (Have you read Eric Flint's Rats, Vats, and Bats?